A pool table light is an annoying distraction if it hangs it too high or too low. Although it should relate to your decor, its size and placement over the table are more important factors. 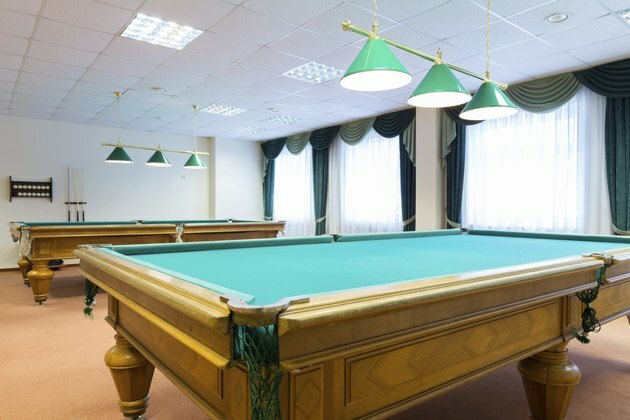 Green lamps hanging above billiard tables in a recreational room. Your pool table's light fixture shouldn't hang so low that you could hit it with your cue stick or a jump-shot ball. On the flip side, if it hangs too high, its bulbs shine in your eyes, distracting your shots. The ideal height is about 30 to 36 inches from the table bed to the bottom of the light's shade or shades. If the pool table isn't in place, gauge the light's distance at about 60 to 63 inches from the floor -- when the table is in place, you can pull it higher with chain, if needed. The light fixture should be long enough and high enough to cast light to the table's edges, eliminating shadows.